University of Notre Dame graduates Grace Johnson and Kelsie Kiley’s documentary, “Project Hopeful,” completed for Documentary Video Production in the Department of Film, Television and Theatre (FTT), is about a new kind of modern family: one where an Illinois couple with seven biological children doubles the size of its family by adopting orphans with HIV/AIDS and special needs. 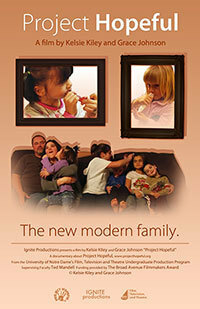 Johnson and Kiley’s film follows Carolyn and Kiel Twietmeyer, the couple who started the nonprofit organization Project Hopeful, and other families who have adopted children through the organization. Johnson and Kiley decided to tell the story of the Twietmeyers and their organization after reading an article about them on GoodNewsGazette.net, a site that publishes only positive stories. Though the two had never worked together before, they agreed they wanted their film to spread the family’s message and not feel forced. After deciding the topic of the documentary, Johnson and Kiley began filming extensive amounts of footage and immersing themselves in the families’ lives, everything from cooking, eating, playing, going to bed and taking their medication. The “Project Hopeful” documentary has been chosen as an official selection for 14 film festivals, including the Notre Dame Student Film Festival; was selected as a New Hope Award Nominee in the New Hope Film Festival; was awarded second place in the Los Angeles New Wave International Film Festival; and won best picture in the RE:IMAGE Film Festival. Johnson, who graduated as an FTT major and peace studies minor, is now a production and development coordinator for Bravo in New York City. Kiley is also living in New York and working as an assistant to producers at Lionsgate Films and Jax Media, LLC. They are still planning to do more work for Project Hopeful. Originally published by Claire Stephens at newsinfo.nd.edu on October 23, 2012.